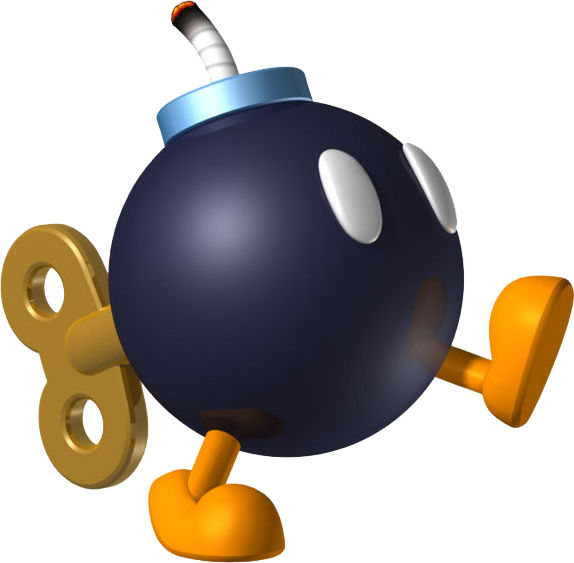 a bom-omb! This short fused terror with legs runs towards your position with the mind-set of hilariously blowing up at your face! (and costing you your bonus point.) You don't want that so you run with that thing running behind you. While running you see 2 pathways. one that leads to the stairs and one that gets you towards a slide. You must decide quickly which path you'll take to hopefully lose that thing! @Jazzer94 You went with the slide, the bom-omb goes too, rolling on it's side like the sphere that it is. The sentient explosive rolls closer...closer...CLOSER towards you but you make it at the end of the slide and rush out quickly. The bom-omb rolls out of the slide and tries to desperatly get itself upright but he cant find his footing. @technotaylor99 I MAY need you for something. Hopefully more votes'll come soon. @Jazzer94 but as you look back you see the bom-omb sad as he tries to get up. You feel bad for him, thoughts of helping him rush though your mind but you didn't forget that thing tried to blow you up. Should you leave the bom-omb behind? @Captain_Toad haha, I never took this too seriously as my avatar isn't exactly fabulous! @Technotaylor Heh, heh. Which is why you're the deciding factor for this next thing. Since you answered my question correctly back earlier I'm giving you the choice of 3 extra votes (1 point for each vote) or give yourself 2 extra points. @Captain_Toad Ah, I see... thanks! Well the smart thing to do would be take the points and run, but i'll just give 'em away. Here's the scores as of now. 7 for Jazzer94 +3 from miss graveheart. @Captain_Toad Take the Bob-omb with me I guess. @Neko_Rukiafan @Miss_Pixelheart Signups are already over guys sorry. But you join the next contest if you want and still vote on this. @Jazzer94 Despite your better judgement and risking your fabulous face you approach the downed being. You help it upright and it's walking again! THEN IT WALKS TOWARDS YOU! Saying "thanks buddy. I'm sorry for trying to blow you up. But I can't be happy without blowing somebody up. Help me?" You think it says in it's bom-omb language. You pick it up. The bom-omb is now your item! I'm prepared to annouce the winners! I think I'll just take the Bob-omb with me but not use it (not really my style ). @Jazzer94 Gasp, you're keeping the bom-omb?! NOW! I shall end this in a hour. Sorry 4 teh delay yesterday, tiring day at the college.